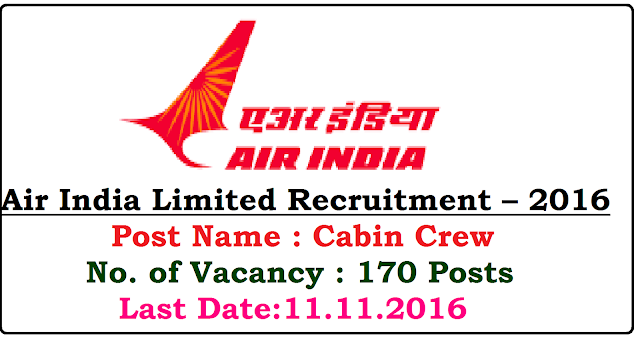 Air India Limited Recruitment – 2016|Air India Charters Limited invites application for the post of 170 Cabin Crew. Apply Online Before 11 November 2016. Selection Process : Selection Will Be Made on Through Group Discussion, Personal Interview & Pre-employment Medical Examination. Application Fee : Candidates belonging to General & OBC Category have to pay Rs. 500/- through Demand Draft in Favour of Air India Charters Limited Payable at Mumbai. Applicants belonging to SC/ ST/ PWD (Persons With Disability) are exempted from such payment of fee. How to Apply for Air India Vacancy : Interested & Eligible candidates may apply Online through the website http://airindia.in/ from 28.10.2016 to 11.11.2016. .